Jabu here! It looks like time has flown by on us and we are down to the last month here in Eswatini! The past two weeks we have been busy with our Futbol Net tournaments that was discussed in our last blog post. We have officially finished our four tournaments for Futbol Net in different regions among Eswatini! All regions were successful and different from one another each day but one thing that was consistent throughout was the excitement from all the students. Throughout the four separate tournaments we had about 6000 primary school students join us for the fun! It was amazing to see the smiling faces on the kids while playing soccer, watching them cheer/sing on their fellow classmates and also show off some of their dance skills. We have also been continuing to go to Sifundzani High School to assist the sport teachers in different sports and activities with the kids. So far, I have helped the sport teacher with the soccer and basketball lessons that they were running as they were preparing for tournaments that their school was attending. From having over 10 years of basketball skills, teaching the basics of basketball to the students (even some have never played before) was very easy and rewarding to see their skills increase over the short time I had with them! We are looking forward to teaching the sport teachers and students some new games and activities that Narissa and I used to play in our High Schools in Canada, including some soccer baseball! Along with going around to communities and schools, I have been in the office planning a team building day for the Olympafrica employees and volunteers along with our EOCGA office to come together. With the two offices being separated, our CEO recommended that a team building day occurs to bring our two offices together and ensure that everyone is in unison moving forward in our next activities including the Olympic Day Run in May. 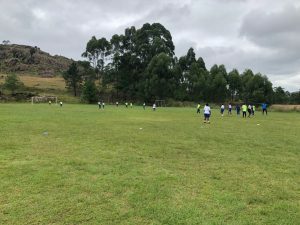 These past few weeks have been incredible being able to get out to schools and communities more and see the impact that Futbol Net and sport has on the people in Eswatini! I am looking forward to see the opportunities that will arise in our last three weeks here! To get more engaged in schools, we’ve been going to a high school nearby once a week. While we are there, we work alongside the sport teachers and help run their gym classes. So far, I have helped with soccer and netball classes. I found helping with netball really interesting because I’ve never heard of this sport before coming here. It has been a little difficult trying to run a class on a sport I know nothing about, but the students have been really helpful with trying to teach me more as we progress. Working with the high school students can be challenging sometimes as many don’t like participating in gym class. 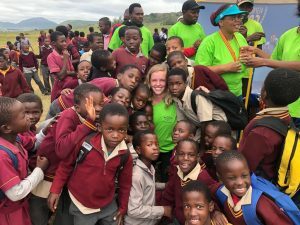 However, since we’ve been there, the sports teachers have shared that they see a lot more engagement with the female students as they see females leading and joining them, which has definitely made it worth it in the end. As briefly mentioned in previous posts, we’ve been planning for the annual Futbolnet tournaments. Futbolnet is played similarly to soccer but focuses more on instilling values during the game. After being briefed on the TRRFCC Values (Trust, Responsible, Respect, Fairplay, Care, and Community), each team makes up their own rules to the game and they gain points based off how they play the game. To name a few examples, teams could gain points for playing fairly, for cheering for the other team’s goals or for passing the ball to all of their players on their team. 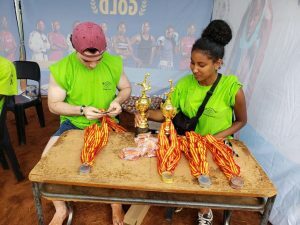 For the tournaments, we went to 4 different communities in Eswatini. In the end, we got close to having 6000 kids from different schools participating. Many of these communities have low sport activities at their schools so it was amazing to see these kids have the opportunity to be engaged in sports. At the tournaments, I would assist with timekeeping and the overall scoreboards. At the end of the tournament, I would also help with distributing the medals and trophies to the top 3 teams. Now that Futbolnet is over, for the last few weeks I’ll continue with doing weekly visits to the high school and also help with the planning of Olympic Day Run. I’m so glad within the last month we were able to really reach out within the communities and engage with kids. Overall, it’s been such a rewarding experience here in Eswatini and it’s been great getting to work within an environment so different from back home. Stay tuned for our final post on our adventures!